When I worked as a web developer, Sublime Text came out of nowhere (Australia, actually) to become enormously popular. I understand it remains popular still, though I believe the newer program Atom has also gained a lot of adherents. One of the best things about Sublime Text, though, in addition to its name, is its flexibility—flexibility that extends to making the program a suitable environment for writers. 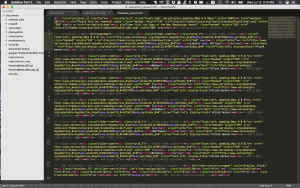 Sublime Text as a programming editor. For years, I’ve heard stories about writers adopting Sublime Text in place of some other software. Indeed, the Sublime Text site now bills the program as “a sophisticated text editor for code, markup and prose.” Having used Sublime Text as a developer, I decided to give it a go as a writer. It works remarkably well. For shorter forms of writing, especially poetry, it is superb. Sublime Text: programming and poetry for $70. The “minimap” feature (which the recently reviewed Write! app also uses) is very helpful in longer narratives, as it lets you visualize where a current line fits into the larger story. Update, 4/9/18: I no longer use Write! software and can’t recommend it. See this article for more information. For my money, though (speaking of which, Sublime Text retails for $70—this gives you a license to use the software on all your computers, regardless of whether they’re running Windows, macOS or Linux), the program’s real killer feature is its exceptionally configurable layout. 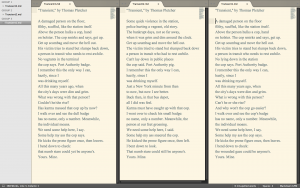 Sublime Text for writers: comparing three versions of a poem side-by-side. I like to compare multiple versions of my work as I move toward a final draft, and Sublime Text’s vertical columns feature (you can have as many as four columns) lets me view multiple versions side-by-side. This is especially useful for poetry, since it provides a direct line-by-line comparison. Sublime Text’s programming heritage remains evident in some ways, but writers should not feel unduly intimidated by this. For example, you need to configure preferences via individual files, and you also need to add a few plugins to make Sublime Text a solid environment for writing. You can install the necessary plugins via the program’s Package Control feature. Only four are really needed: Markdown Editing, Pandoc (which lets you export your Sublime Text work to Microsoft Word), Side Bar (a better replacement for the default sidebar) and Word Count. 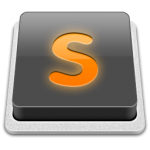 If setting up Sublime Text seems a bit too hands-on, then there are plenty of other solid writing apps out there, including the aforementioned Write! But if you like the idea of customizing your writing environment, and the capability of directly comparing multiple versions of your work appeals to you, you’ll find Sublime Text very satisfying. You may even find it sublime. 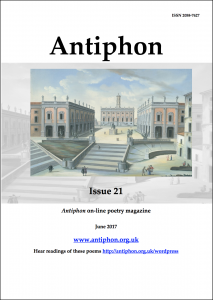 I recently published a poem in Antiphon, the estimable UK online poetry magazine. Although the poem’s title is “High,” the heading of this post refers to the magazine as a whole—it is simply excellent, and serves as a wonderful antidote to today’s bleak morning headlines. Antiphon issue 21—a labor of love. Antiphon is edited by Rosemary Badcoe (who is also the magazine’s designer) and Noel Williams, and it is an obvious labor of love. Each issue (which the magazine’s website notes is archived by the British Library) features a wide range of poetry, with careful attention paid to sound, rhythm and image. The magazine is friendly towards metrical and non-metrical work, and its editors have very good ears. Some of the standout poems in this new issue (no. 21) include “The Weather We Call Raw” and “Sylvia’s Games” by David Troupes, “A catch-all” by Patrick Theron Erickson, “A Bag of Frozen Kidney Beans” by Burgi Zenhaeusern, “C282Y” by Susan L Leary and “Afterwards” by Anthony Watts. There are a number of other very good poems as well. The tone nods toward the traditional but standards are quite high (no pun intended). You won’t find any Michael Robbins poems here. Not that there’s anything wrong with Michael Robbins; he simply operates with a different set of criteria in mind. Ms. Badcoe says, in her prologue to this issue, that she disagrees with the idea that all poetry is political. 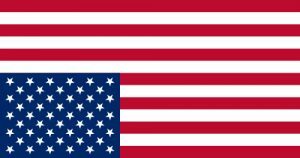 I concur—politics tends to coarsen language and ideas, and never more so than today. I’ve spent far too much time recently thinking and writing about political issues. It is enormously liberating to take another path and come at the world and its meanings from a different angle. Poetry is an endangered species these days. 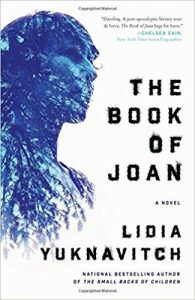 I read recently that fewer than seven percent of American adults read it at all. This is highly unfortunate, because poetry has a special role to play in fostering greater understanding. I’m delighted to be published in Antiphon. I’ll reproduce “High” here eventually but I’d like to give the magazine exclusivity until their next issue appears. In the meantime, the Antiphon blog features audio recordings of many of the poems in this issue, including mine.